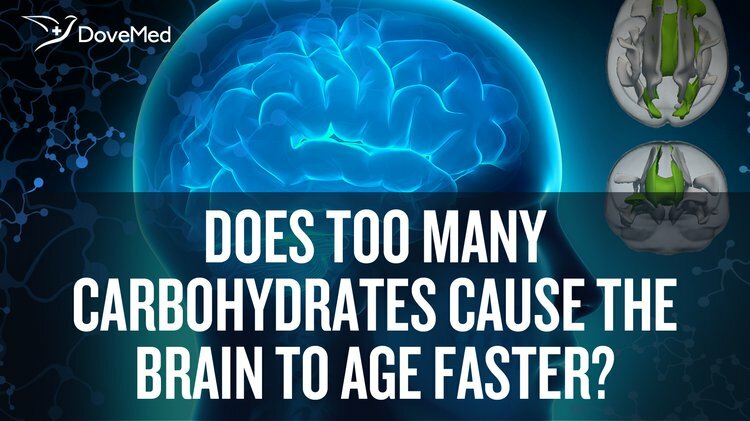 Do Too Many Carbohydrates Cause The Brain To Age Faster? Carbohydrate consumption is essential and necessary for the brain, thus regular intake of carbohydrates for the body cannot be understated. However, there are limits to carbohydrate requirements in the body. The foods we consume have different nutrient components. The National Health Survey (NHS) describes the 3 major nutrients that all individuals consume: proteins, fats, and carbohydrates. When carbohydrates (in the form of starch, sugar, or fiber) are broken down, they release glucose into the blood stream. This glucose is up taken and used as instant energy by various cells, which include the brain cells. The brain is more dependent on glucose in the blood than many other cells such as the muscles cells. This is because neuron cells that make up the brain cannot store glucose, even to a limited amount like muscle cells. The brain depends on glucose from carbohydrates being supplied regularly for energy, to carry out its functions properly. It has been suggested that brain cells need two-times more energy compared to other cells; the work done by the neurons takes up almost 10% of the body's energy. According to a study by Richard J Wurtman, neurons double up as the ‘releaser’ of the hormone serotonin. This hormone is said to be involved in pain, sleep, mood changes, and blood pressure regulation. Thus, it takes a regular supply of glucose from carbohydrate intake to perform this activity. The activities may decline if glucose supply diminishes. This can be compared to the concept of a car running on low fuel, such that it eventually comes to a stop. But what happens when people consume carbohydrates in excess? Studies have showed that high blood sugar levels might result in insulin production. This can cause glucose to be stored up in cells and hence, result in the brain cells not receiving enough energy. Overtime, this can damage the brain, since constant deprivation of energy to a cell will lead to cell death. And when more and more brain cells die, it can lead to increased aging. Researchers at Brown University used mice as models to study the effect of too much carbohydrates on the brain. They found that interfering with certain insulin signals to the brain, such as what occurs due to excess grain and sugar consumption, could induce several symptoms mimicking Alzheimer’s disease. This indicates that obese individuals and those suffering from chronic lifestyle diseases, like diabetes, are at a high risk of damaging their brain permanently, owing to continued consumption of large amounts of carbohydrates. High sugar intake over time can also cause a progressive decline in mental ability over time due to the development of depression. Carbohydrate consumption is essential and necessary for the brain, thus regular intake of carbohydrates for the body cannot be understated. However, there are limits to carbohydrate requirements in the body. The USDA Institute of Medicine informs that the recommended dietary allowance (RDA) for carbohydrates is 130 g per day for adults and children. Excess carbohydrates can cause dental decay to obesity to many other cardiovascular illnesses, as well as cognitive impairment from brain damage that can even be permanent. Hence, a moderate consumption of carbohydrates similar to the USDA guidelines is advised. Wurtman, R. J., & Wurtman, J. J. (1995). Brain serotonin, carbohydrate‐craving, obesity and depression. Obesity Research, 3(S4), 477S-480S. Carper, J. (2001). Your Miracle Brain: Maximize Your Brainpower* Boost Your Memory* Lift Your Mood* Improve Your IQ and Creativity* Prevent and Reverse Mental Aging. Harper Collins. Perlmutter, D. (2013). Grain brain: the surprising truth about wheat, carbs, and sugar--your brain's silent killers. Hachette UK. Beers, M. H. (2005). The Merck manual of health & aging. Random House Digital, Inc..